A lot of “How to learn guitar” lessons will try to convince you to start with a simple acoustic guitar. Maybe even a classical, nylon string model, because the neck is nice and wide (for novice hands) and the softer nylon strings are easier on your unpractised fingers. But here at Uberchord (click to download the free guitar learning app) we get that your dream is maybe about playing electric guitar. And if that’s what you want to do, then starting out with a good electric instrument makes sense. But what makes a “good” guitar? 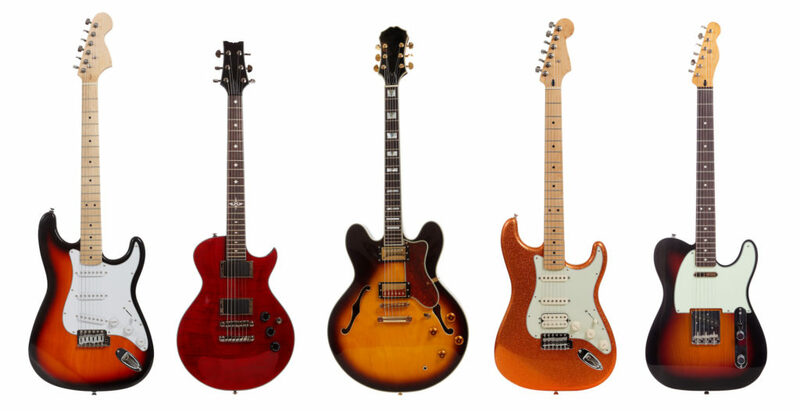 Well, if you are confused about what kind of Guitar to buy, you can check out our post on: Types of Guitar: Beginner’s Guide to Buying A Guitar. If you can afford to go to a store and drop $3000 on the latest, greatest Les Paul Gibson or vintage Fender Stratocaster, this is a very different question. But let’s assume your budget isn’t quite that big. Many affordable guitars are very similar, but come in a variety of packages that include lots of extras and even an amplifier. In case you are looking to buy the amp separately, here is an amazing list of 10 Best and Affordable Guitar Amps for Beginners: 2016 and while you are it, check out: Top 5 Guitar Plug-Ins You Need to Know: AmpliTube, Guitar Rig & Others. Something else to understand is that different styles of guitars offer specific pickup and switching designs that define the guitar’s sound. Depending on what type of music you want to learn, some guitars will be good and suit you better than others. That frequent adjustment of the guitar’s electronics during a song will become a big part of your playing style and it’s worth learning from the outset. Read on, and you’ll see what I mean. Oh—and a word of warning. Some “beginners” guitar bundles are for kids. Make sure you’re buying a full-sized instrument. Do you want that genuine Fender sound? Everything you need in one bundle? This deal leapt out of the page at me straight away. 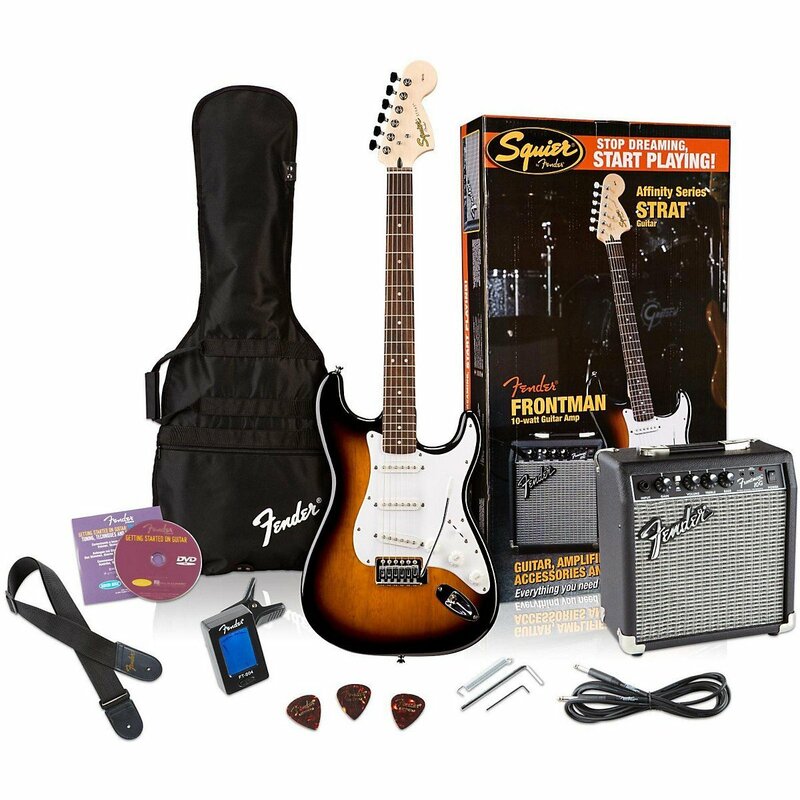 The Fender Squier series has been around a while and even though it’s a budget guitar, you can always rely on Fender for great quality. But what I like the most about this package is that everything you need is included (apart from a guitar stand) and the Frontman 10G amplifier has some extra features that are excellent. The amp has an input for a playback device to jam along to (like your iPad or Smart phone, or even a CD player) plus a headphone output for when the neighbours get too annoyed. A Gain control and Overdrive switch let you grunge everything up, or you can dial it back to a classic, clean Fender sound. Importantly, the Fender Squier Strat has the same five-pole position pickup as any Strat. Like I said, if you’re going to be a “Fender player”, learning how to use those different positions and all the sounds they create is a big plus. Are you into classic rocks tones? 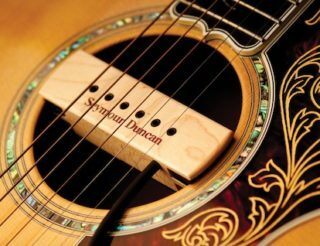 Check out this fret board for a different playing experience. Just as there’s a big benefit in learning the different pickup sounds from a Fender Stratocaster, a Les Paul style of guitar has its own definitive pickup design and switching with a range of unique sounds that only a Gibson Les Paul can make—or the more economical Epiphone models. 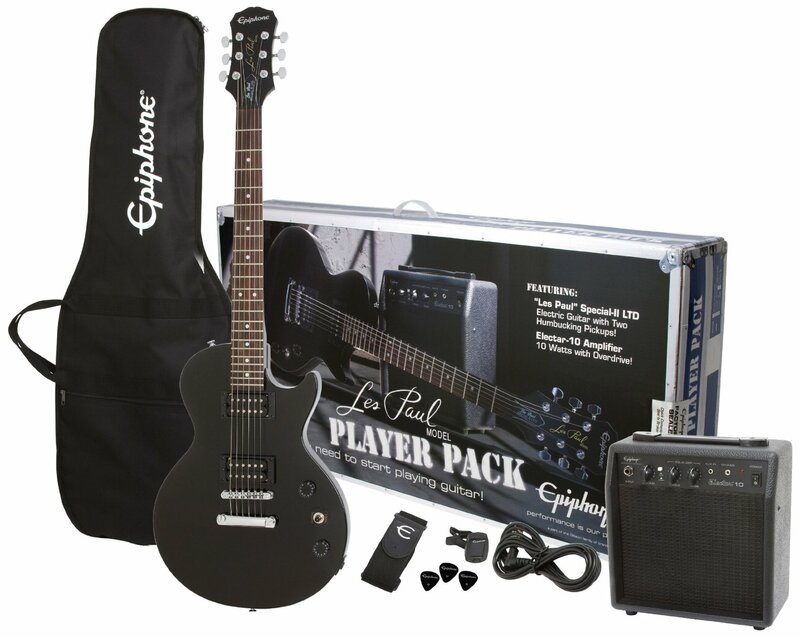 So, if you’d like to emulate some of the guitar greats like Jimmy Page (Led Zeppelin) or Slash, this Epiphone package again with all the extras you’ll need—but with an Epiphone guitar—is a great way to start. Also, it’s worth mentioning that Gibson/Epiphone Les Paul designs usually have a slightly rounded, more narrow fret board and, in my opinion, are a little easier to play compared to the flatter, wider Fender fret boards. But I strongly recommend you don’t take my word for that. Get into a music shop and try the two types of guitar for yourself. If you like your music heavy, try this guitar. 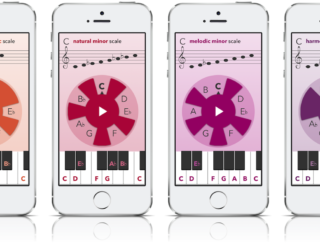 Do you want lots of different tones from one instrument? Getting away from guitar packages and looking at just instruments, what’s so special about this Schecter? First of all, the pickup configuration is getting into the heavy metal side of things and, like the two previous recommendations, it offers a great introduction into changing your sounds on the fly. You know that expert players are constantly stomping on effects pedals to change the tone of the guitar, but they’re also tweaking the pickup positions, tones and volumes to create unique sounds, too. This Schecter is an entry-level guitar into those kinds of tones that are an alternative to the standard Fender and Gibson sounds. Also, the arch top offers another kind of “feel” for playing that gives you slightly more accessible right-hand technique (it’s subtle, but it’s there), plus the body shape tucks the switches and controls out of the way. Is modern country music your thing? The master of the clean, edgy sound. This beginner’s Fender Squier Telecaster gets a special mention because, if playing modern country music is your thing, then you need a Telecaster. Telecasters give you an edgy, very clean sound that works well with any right-hand picking technique. Telecaster players are constantly slapping that three-position pickup switch back and forth between the mellow forward pickup and the solo rear pickup—and you will be, too. A lot of blues players like the Telecaster as well, because combined with some of the vintage Fender tube amplifiers that clean sound still cuts through. Be aware that any Telecaster design should have that quite defined “Tele” tone. Do you want to be a classic, country player? A unique jazz sound that nothing else delivers? 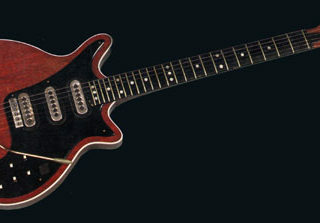 This is a good example of a value-for-money, hollow-bodied guitar. Hollow-bodied guitars are very popular with jazz guitarists, but they’re also so classic “country” that any extras should include a bale of hay, cowboy boots and a ten-gallon hat. Between the pickups designs and that special, hollow body these guitars have a very special sound indeed, so again make sure it’s what you’re after. Also know that hollow-body guitars are physically much larger and some beginner players might find them more than a handful. But for pure country tones you can’t beat them. So there you have five good beginner’s guitars. Bear in mind that while the quality of these instruments is good—it’s a fiercely competitive area—they’re at the bottom of the market. You get what you pay for (as they say). At the same time, “cheap” guitars like these have come a long way in the last ten years and they’re excellent for starting out, before deciding to mortgage your house on that expensive vintage Fender or Les Paul Gibson mentioned earlier. These are cool online offers. But every guitar is different and if you can, try your local store and get a real feel for the instrument. It can be the start of a long journey together. Happy playing! So, do you have any thoughts on ESP LTD EC-256? I only found something on music skanner about it? Is is worth it?